Applications are available October 1 on the Law School web site. Application review begins in November. Application deadline is May 1. The nonrefundable application fee is $70. Is the LSAT required for admission to the LL.M. program? No, the LSAT examination is not required for admission to the LL.M. program. Do you require that my law degree be certified by my country’s bar association or the American Bar Association? Do you allow transfers of LL.M. or J.D. credits from other institutions? No. Participants in the University of Minnesota Law School’s LL.M. 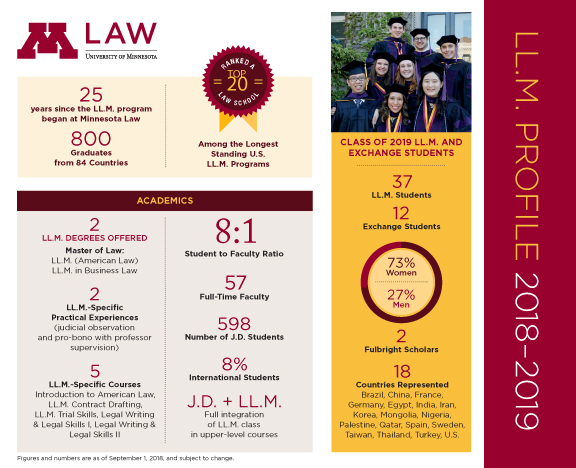 Program are expected to complete the full academic year (a minimum of 24 credits) at Minnesota Law. What are the University of Minnesota’s LL.M. program dates? The class of 2020 program begins on August 8, 2019, with the mandatory “Introduction to American Law” course, and continues through graduation on May 16, 2020. One-year deferrals are granted on a case-by-case basis. Historically, the Admissions Committee has granted a deferral for extraordinary circumstances, such as the inability to secure a visa or financial hardship. To reapply, you must send an email explaining what you have been doing since your previous application, requesting that your file be reactivated, as well as the current application form and your updated resume and transcript(s) for any additional course work you have completed. What materials must be submitted to reactivate a deferred admission? To reapply, you must send a letter explaining what you have been doing since your previous application, requesting that your file be reactivated, as well as the application form, the current financial certification statement, your updated resume and transcript(s) for any additional course work you have completed. May students begin this program in the spring semester? No. The LL.M. program is a two-semester course, with a fall start only. All students are expected to complete the required 24 credits within one academic year. The Business Law LL.M. is a separate degree from the LL.M. in American Law. Students must specifically apply for the Business Law LL.M. during the application process. A student may not switch to the Business Law LL.M. program after being accepted to the LL.M. in American Law Program. The Business Law LL.M. requires 17 credits of business law courses and in order to earn the degree, a 2.0 overall grade average must be maintained. In both cases, at least 24 total credits are required to earn the LL.M. degree. Is an English proficiency exam required for admission to the LL.M. program? Each applicant must prove English language proficiency. Either the TOEFL or IELTS is acceptable for admission to the LL.M. program. If an applicant has completed a higher education degree where the language of instruction is English, they may request a waiver of the exam score requirement. Admitted students who do not provide a TOEFL or IELTS score on the basis of completing a degree in English are not eligible for extra time (known as a “variance”) on final exams. What is the minimum English exam score? The minimum score required on the TOEFL exam is 80, although strong preference is given to applicants with scores over 100. The minimum score required on the IELTS is 6.5. What are the University of Minnesota’s ETS TOEFL institution codes? The Institution Code is 6874. The Department Code is 03. How many people apply for this program? We receive approximately 250 applications per year on average. We enroll a class of 50–60 students annually. Is the LL.M. program only for international students? You must have completed a law degree at an institution outside the U.S. The purpose of the LL.M. program is to provide international lawyers with exposure to the American legal system. International lawyers gain insight into the common law system and case analysis, while familiarizing themselves with American culture through interaction with J.D. students and other professional and social events. What is the cost of the LL.M. program? If offered admission to the program, you must provide evidence of financial support for tuition and fees (estimated at $56,600 for 2019-20), mandatory health insurance and textbook costs (estimated at $4,100 for 2019-20), and living costs for one year (estimated at an additional $15,500 for one person in modest student accommodations). Limited funding is available from the Law School for tuition only. Every admitted student is automatically considered for a scholarship. Does completion of the LL.M. degree qualify students to take a bar exam in any state? The LL.M. degree may enable students to sit for the bar in jurisdictions that allow LL.M. graduates to take the bar. Each state has its own regulations regarding qualification for a state bar exam and students should do their own research regarding these regulations. The National Conference of Bar Examiners annual guide includes bar information for all individual states. Completion of the LL.M. degree does not qualify students to take the bar exam in the State of Minnesota. What is the difference between the Business Law Concentration and the Business Law LL.M.? The Business Law Concentration is an option for students earning the LL.M. in American Law. The LL.M. in American Law with Business Law Concentration requires that you take 15 credits of business law courses. You must earn a 3.0 grade (B) in each of the business law classes to earn the certificate. You will still earn the LL.M. in American Law degree, if you do not meet the grade requirements for business law courses.